Will technology help you develop a career in comedy? How many people do you know who’ve done a comedy course and dream of ditching their current job to become a stand-up? Comedy continues to be massively popular with audiences however the road to fame can be a hard one for comics. Undoubtedly it’s a challenge for anyone but the very top acts to make a living. It’s great that someone like Bo Burnham can go from YouTube recordings to sell-out shows, but giving comedy away for free online isn’t sustainable for most comics. So, where does the future of comedy lie? Will there be a dearth of diversity as only the ‘panel-show’-worthy survive? Or will breakthrough comedians catering to a wider range of tastes find their audience with the launch of new online comedy platforms? Firstly, we predict that niche online streaming services, such as NextUp Comedy, will draw in new audiences who wouldn’t previously have considered themselves ‘comedy fans’. The online space doesn’t have the same barriers to entry as traditional comedy clubs which have had a reputation as stomping grounds for stag dos and groups of raucous friends egging each other on to heckle. Watching comedy online is more flexible – people can do it in their own time, wearing pants (if that’s their thing). They can also take the risk of watching someone new without the humiliation of walking out of the room. This way they can discover new favourites that they will pay to see in person. As a result the ability to stream comedy will bring bigger and more wide ranging audiences into live comedy venues. That must be good news for the career-changing comedian! Online video also provides greater longevity of individual shows for comedians. Imagine writing a full hour of carefully crafted material only to have it disappear after a month in Edinburgh. With much easier access to great camera equipment, when their shows are captured and preserved, new comedians will have a better chance of building an audience of fans, creating a new revenue stream, and developing a long-term comedy career. With greater career chances for new comedians we will see a broader range of comedy. 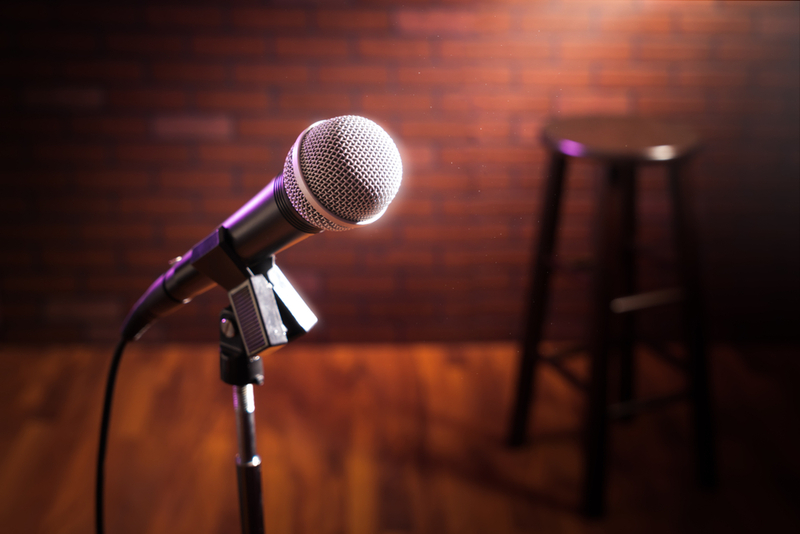 Giving airtime to a new ‘out there’ comedian in a club can be a risky move, and this caution has also been playing out on TV, where jokes that are considered potentially offensive or borderline are being edited out. A favourite quote of mine is from the legendry comic George Carlin who said “’I think it’s the duty of the comedian to find out where the line is drawn and cross it deliberately.” A lot of people yearn for comedy that pushes boundaries. We see it time and time again, with comedians like Bill Hicks and Frankie Boyle; pushing the boundaries of what is acceptable helps people laugh at the harsh realities of life. By establishing online comedy as a major platform, viewers will have a choice over what comedy they watch and comedians (like you?) can be their true, unedited selves. Hopefully, this will contribute to a new golden age of comedy, where creativity and diversity are highly-valued. See you on the The Comedy Stage? Live comedy will always have a special place in the nation’s heart and since comedians like Michael McIntyre are filling huge arenas, there’s no reason why comics won’t become the headline acts at big arts-focussed festivals like Glastonbury. Festivals such as Bestival and Latitude already have dedicated comedy tents and are attracting big name comedians. The idea of a specialist comedy festival, in the same way we have music festivals (in fields with tents etc. ), may not quite work. However, I think the dominance of comedy at mixed arts festivals like the Edinburgh Fringe will lead to more cities hosting comedy festivals where they can utilise clubs, pubs, libraries and other community spaces as venues. We already see this happening in Brighton and at the Camden Fringe. They may currently be only 10% of the size of Edinburgh but they have the potential to grow significantly. There are other places that could serve as great city-venues. How about Bristol? Technology will help comedians spread their material further, but it could also change the very nature of their acts. Using props, sound and lighting, comedians already transport viewers into different worlds, whether it’s a childhood flashback or a surreal post-apocalyptic sketch. As VR, AI and augmented reality become cheaper and more accessible, I can imagine comedians using these technologies to transport the audience even further into their weird and wonderful minds. So, far from technology leading to a dearth of creative comedy, I am optimistic that technology will 1) help give more new comedians a chance to succeed by putting them in front of wider audiences and creating a revenue stream; and 2) help comedians further engage their audience, find new fans, mix things up a little. With this comics can find their niche and continue to serve an important purpose in culture and society. And with everything that’s been happening in the world recently, we need more of you to give this a go!